One of the first books I ever bought for the Third Edition of the Dungeons and Dragons RPG was, of all things, a Diablo themed sourcebook, named Diablerie. It was a solid adaptation of the Diablo 2 character classes, magic items and a host of spells for 3rd Edition D&D, made by Wizards of the Coast themselves. That meant that the products were of a high quality and made by people who knew D&D inside and out, created as part of a partnership between Blizzard and WotC to help promote Diablo 2. 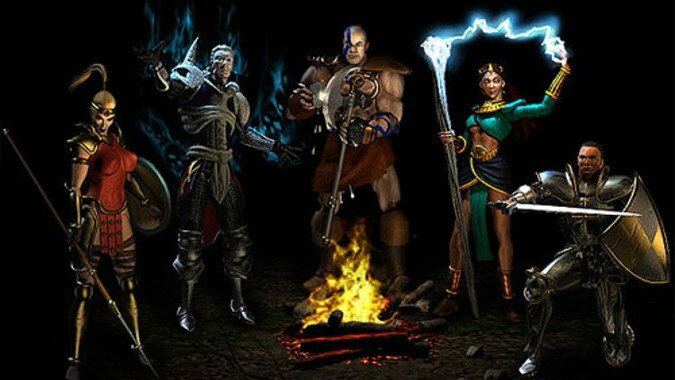 Both Diablo 2 and the 3e version of D&D were released in 2000, although there had been an earlier release, Diablo II: The Awakening which had come out in may of 2000 that used the 2nd Edition of the AD&D ruleset. What both of these books had in common is that they were the last and, to my knowledge only licensed pen and paper RPG products for the Diablo setting. While Blizzard would go on to license the Warcraft setting to White Wolf — the original publishers of the Vampire the Masquerade RPG — the Wizards of the Coast Diablo products are the only ones ever made in that setting. As such, they’re not D20 System compatible books, as the Warcraft ones were — they’re outright D&D rulebooks. The Awakening was basically a combination of a RPG sourcebook allowing you to adapt Diablo characters to your AD&D game and adventures based in part on elements from the original Diablo game. When Diablerie came out, it much more fully served as a sourcebook on how to run a Diablo based D&D campaign, while the adventure To Hell and Back essentially converted the story of Diablo 2 into a series of adventures that one could base a campaign on. What I really found fascinating then and still do today are the ways that Diablo is really easily adapted to D&D, and the ways it isn’t — D&D has always been a group game while Diablo has a certain single-player vibe, and there aren’t any real healer classes in the Action RPG classic. To Hell and Back gave you the option to play as either D&D classes like fighters, clerics and bards, or you could play D&D conversions of Diablo classes like Amazons or Assassins. Considering that these products were all essentially marketing for both companies — Diablo 2 was Blizzard’s biggest release of 2000, while the 3e release of Dungeons and Dragons was essentially a re-invention of the game for tabletop players — it’s amazing to me how good both Diablerie and To Hell and Back were. I have never seen a pen and paper RPG product adapt a video game as well as this. I wish Blizzard would do more stuff like this — either do it in-house or license some of their properties. I think an Overwatch RPG would be an amazing thing, and with Diablo Immortal being worked on a nice return to Sanctuary in tabletop form wouldn’t be a bad idea.